Construction crews have been hard at work on the nine-foot diameter New Irvington Tunnel since July 2010, and its opening on Friday marks another milestone in the $4.8 billion Hetch Hetchy Water System Improvement Program to upgrade and replace aging infrastructure that brings water from Hetch Hetchy reservoir in Yosemite National Park, 167 miles away, to the Bay Area. A key goal of the voter-approved program, which is scheduled to run through 2018, is to make sure that taps in the homes of the 2.6 million Bay Area residents who receive Hetch Hetchy water keep flowing with water 24 hours after a major earthquake. According to the U.S. Geological Survey, there is a greater than 60 percent chance of a major earthquake taking place in the Bay Area in the next 30 years. The Hetch Hetchy water system has been operating for more than 80 years, and much of its infrastructure – including pipes, local reservoirs and a 90 year-old rock and earth-filled dam – is in need of a makeover to shield it from earthquakes. Some of the construction projects are also intended to provide redundancy and a back-up to structures that are critical to bringing water from the Sierra Nevada watershed to the system’s customers, who live in San Francisco, Alameda, San Mateo and Santa Clara counties. For example, the New Irvington Tunnel operates alongside the existing Irvington Tunnel in Sunol Valley, which brings water from the Hetch Hetchy reservoir into the Bay Area. The existing Irvington Tunnel, which has not been taken out of service since 1966, when it was last inspected, is vulnerable to earthquakes, experts say, and lies between the Calaveras and San Andreas faults. The new tunnel, which is steel-lined and encased in concrete, has been engineered to withstand a magnitude 7.1 earthquake on the Hayward fault. “We’re actually constructing the New Irvington Tunnel parallel to the existing tunnel,” said Wade. “We’ll be able to take the existing tunnel out of service, make any repairs, and then both tunnels will be in service,” he added. Both tunnels will carry water not only from Hetch Hetchy but also from the nearby San Antonio and Calaveras reservoirs. 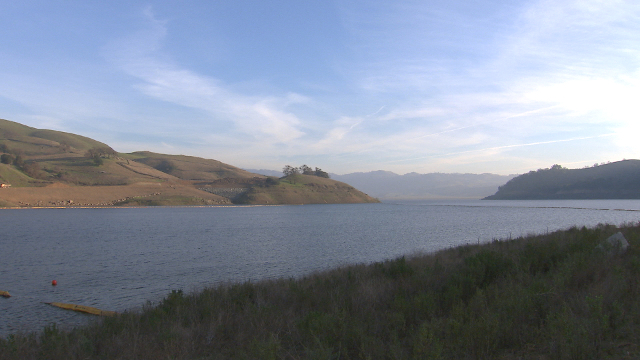 The Calaveras Reservoir, which is the largest of the system’s five local reservoirs, is also in need of a seismic makeover. Its 90 year-old earth- and rock-filled dam, which forms the reservoir, is located on the Santa Clara – Alameda county line, and is located only 1,500 feet from the Calaveras fault. Since 2001, state dam regulators have only allowed the reservoir to be filled to 40 percent of its capacity because the dam is prone to liquefaction, which happens when waterlogged, loose soil behaves like a liquid during the violent shaking generated by a big earthquake. 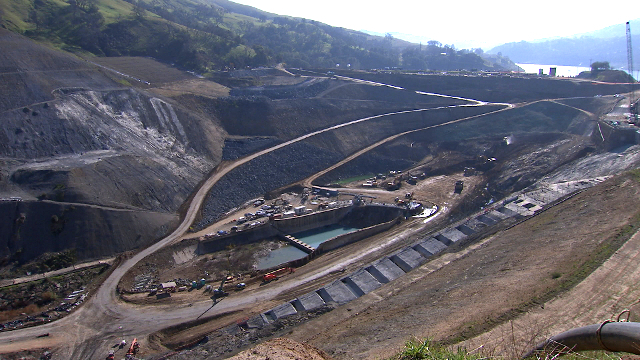 As a result, construction crews are building a new, 220 foot-tall seismically safe dam a few hundred yards downstream from the original dam in the hills southeast of Fremont. At a cost of $720 million, replacing the Calaveras Dam is the biggest, most expensive and last remaining major project under the Hetch Hetchy Water System Improvement Program. Although it will also be made of earth and rock – roughly 10 million cubic yards’ worth – cement grouting is being sprayed between spaces within the rock to create a more water-tight foundation. The reservoir will then be able to fill to capacity – 100,000 acre-feet or 31 billion gallons – when construction on the new dam finishes in 2018. For Wade, filling Calaveras, the largest of the system’s five local reservoirs, to full capacity will not only boost water storage but help the regional water system cope with multi-year droughts. “We’re in the third year of a major drought,” he said. 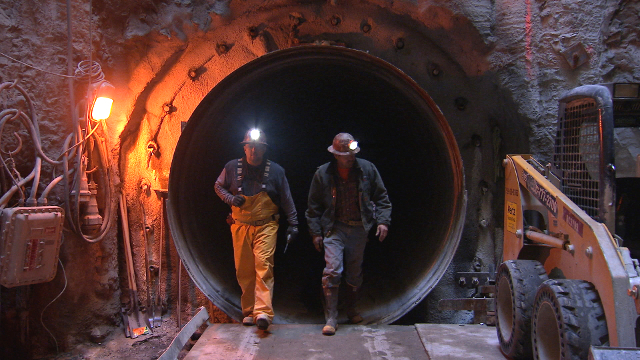 To find out more about the New Irvington Tunnel and Calaveras Dam replacement projects, watch this video produced for KQED Newsroom.